The ergonomically designed IR 6.4 handpiece is used on skin types I-V for body contouring, tightening of lax skin,wrinkle reduction and more. 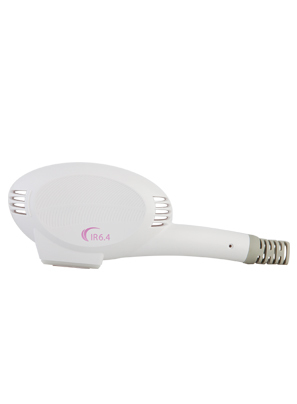 It has a spot size of 6.4 cm2, and its long wavelength of 850 – 1750nm allows you to easily reach the deeper reticular dermis. The handpiece’s software lets you choose from three pulse modes- mild, medium and intense, for delivery of fluency up to 60 cm2. To protect the epidermis from unwanted heat elevation and ensure a pleasant treatment experience, the handpiece has a Sapphire contact cooling tip. Cooling is used before, during and after each 4-6 second IR pulse.